The development was described recently to Publishing Perspectives by a distributor in the industry. The effect is that when a consumer goes to a book’s sale page, the first option to buy in each format may not feature the book’s publisher’s offer, as has been the case in the past. Below is a set of buy-option boxes chosen at random. They’re from the sales detail page for a recently published title from HarperCollins’ Ecco imprint. Critics of Amazon’s new policy say that re-sellers, not an original publisher, may have their editions featured in buy-option boxes on books’ sales pages. If a re-seller is getting a sale, the “ships and sold by” line on the buy button will change to that vendor’s name. 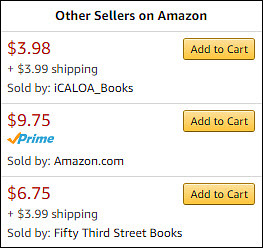 What the newly instituted Amazon approach may do, the Guild and others are saying, is promote one of the editions you normally see under a box (such as “35 New from $11.65”) into the featured spot. That, in exchange would result in the “buy button” on the page taking the sale not to the publisher but to the third-party re-seller, presumably at a discount. In this instance flagged by the IBPA, the buy button for Seal Press’ ‘Second Wind’ gives the sale to a vendor at $3.23, not to the publisher at $10.62 . Publishing Perspectives’ own tests have not yet rendered a case in which the original publisher isn’t offered as the featured option. The Independent Book Publishers Association (IBPA), however, cites a case in which a book by Cami Ostman, Second Wind: One Woman’s Midlife Quest To Run Seven Marathons on Seven Continents, had a buy button going to a vendor rather than to the original publisher, Seal Press. In that case, the third-party re-seller is offering the paperback new for $3.23, while the Seal Press price was $10.62. In another instance provided by an industry observer to Publishing Perspectives—Andrew Shaffer’s Great Philosophers Who Failed at Love (2011, Harper Perennial)–the $6.98 new edition that’s the default on the buy button is from a third-party seller named Big River Books. But looking below the buy button box to “Other Sellers on Amazon” reveals the $9.75 price asked for the same new paperback by the publisher. This is clearly a case in which the third-party re-seller’s offer is taking the lead in Amazon’s listings. The new program is based on re-sellers vying for the featured spot on these buttons, as Publishers Weekly‘s Jim Milliot covers it. “We have listed and sold books, both new and used, from third-party sellers for many years. “The recent changes allow sellers of new books to be the ‘featured offer’ on a book’s detail page, which means that our bookstore now works like the rest of Amazon, where third party sellers compete with Amazon for the sale of new items. The Authors Guild article stresses what it sees as a distinct disadvantage to authors and publishers: “A secret algorithm–which reportedly weighs factors such as price, availability, and delivery time–will now decide which seller (i.e., Amazon or a third party re-seller) gets the buy box. In its statement, the IBPA writes, “When you buy a book, Amazon pays the publisher 45 percent of the list price. This means your purchase is supporting the entity that published the book, namely the publisher, and authors are making a profit (albeit small) every time you buy because the publisher is paying an author royalty for each sale. “One might wonder how there can be ‘new’ copies offered by someone other than the publisher and how they can be sold for $.01 plus shipping (the high shipping costs are apparently where these sellers make their profit). “The Authors Guild has spoken to several major publishers in the past year about where all these second-hand ‘new’ copies come from, and no one seems to really know. Some surmise that they are review copies, but there are far too many cut-rate ‘new’ copies for them all to be review copies. If the books offered by third-party re-sellers are actually new, then payment should have been made to a publisher, and thus to an author. That makes it difficult to be sure that a sale made by a third party of a new book on Amazon is, in fact, a complete loss of revenue to a publisher and author. 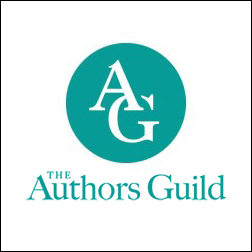 The Authors Guild further speculates that the new policy may be related to Amazon’s POD (print-on-demand) services offer, but sources Publishing Perspectives is in touch with at Amazon say that this is not the case. There is, they say, no link between opening the buy box to third-party new booksellers, and Amazon’s POD offerings.